I had to miss this tour due to unforeseen circumstances, but now I can check it on this DVD. 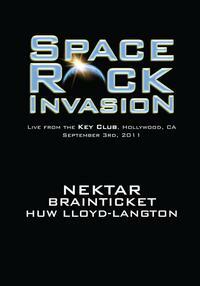 The tour featured Huw Lloyd Langton (of Hawkwind fame), Brainticket and Nektar. Well, I’ve been a fan of Langton and Nektar for years, but had never heard of Brainticket before. I’d have to say, I’d love to check out some of their music after this video. One thing that does need to be mentioned, though, while there was some cool lighting on the stage, there really should have been a little more light for this video. It’s all a bit dark and sometimes hard to see. The only other technical issue is a bit of a video audio synch problem at the start of the second DVD – yes, this is a two DVD set. 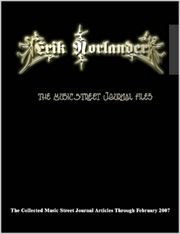 The first DVD features Langton and Brainticket. We get four songs from Langton, delivered on acoustic guitar. One is from his solo career, while the other three are Hawkwind tunes. The first two songs he delivers purely solo, then one of the members Brainticket shows up to play flute on “Solitary Mind Games.” Then more of the group show up for the closing number, “Rocky Paths.” I have to say the performances are good, but Langton’s vocals are sometimes a bit hard to take. When he talks between songs, he’s a bit hard to understand, too. Brainticket put in a scorching set that seemed to be part psychedelic rock, part Hawk-like space music, part jazz and a lot performance art. The female vocals are often dominated by processing and effects and sometimes off-key. But, this group puts in an energized show and I’d love to see them live. Disc two is all about Nektar, and this group has always been a favorite of mine. Musically speaking, you can’t ask for more than these guys put forward here. The vocals, though, sometimes seem a bit rough and strained. I think part of that might be the sound at the venue, though. Part of it might also be that it’s the last show on the tour and, as Roye Albrighton states, they were “knackered.” Whatever the reason, though, it does detract from the performance, but only a little. All in all, it’s great to get a live video of this show. I should also mention there are interviews with each of the performers after their concert showing on the set. All in all, this thing comes highly recommended, but with a few reservations.